Have you ever sat at home on your own and listened to your favourite piece of music? Have you felt the need to turn up the volume that extra notch, knowing that you shouldnt because it could damage your ears or annoy the neighbours? And have you then felt free because you identify with the music soaring from the speakers. Enjoyed that tingle down your spine when the chosen track reaches its climax and been overwhelmed by an incredible sense of joy, understanding energy and sadness. If your answer is yes then hopefully your understanding of what goes through my head and is conjured in my brain when I listen to a piece of music by Godspeed you Black Emperor will be increased. Its not just the music although the most important part which makes this group so interesting and incredible. It is also their relationship with a record label called Constellation and their manifesto, which has influenced and struck a cord with my approach to life and the way in which we live. Constellation is founded on two main principles that of independence and real community. Both of which involve the breaking down of the capitalist system and all its traits in order to be realised. But as we all know or should realise the system to which we are bound "is at a certain level inescapable. "2 As the founder member of Godspeed Efrim explains, "its like the debate about consumption  the next thing youre saying youre not going to eat. "3 Ian and Don the founders of Constellation are proposing that we break free to a level that is understandably possible of the artistic sterility that capitalism breeds. This can be seen in the successive manufactured bands and pop stars who will go to extreme lengths to attain more exposure, " The whole business is a process of acceptance. Its like, OK, I realise I need to do this  A, B  to get to C. such pragmatism will be music to the ears of DreamWorks Records,"4 all in the pursuit of fame and money. In fact it is possible to say that the music that these so called artists produce is secondary to their status in the minds of the consumer driven public. Which is sorry state to be in considering the amount of time and dedication that bands like Godspeed you black emperor put into their work and indeed do all the bands on the Constellation label. They are also not alone in feeling this way towards "Corporatism" and the way it "divides and conquers and falsifies social participation in its preformed, group-tested, hermetically sealed cycle of marketed product, setting up a closed circle of blind consumption. "5 As well as being money driven capitalism has also bred a new and unethical way of producing the superficial objects it shills. Unlike most other independent labels Constellation seem to understand their position in the world and can admit "putting out rock music however experimental and boundary pushing is only obliquely a political and social activity. "9 They are honest and not disheartened by the gargantuan monster of "blind consumption"10 that opposes them and their goal. In the same way Godspeed are aware and fearful of their representation by the music industry and the way in which critics change what has been said to satisfy their own concepts. " " 11It is understandably hard for a band to have a political view point, when it must pass through ignorant hands to reach its audience. We deal with bands face-to-face, without formal contracts, on the basis of ongoing discussion and mutual decision-making"12 Which means that trust and understanding are foremost on the agenda of each person involved helping to break down feelings of anxiety and alienation. These emotions and others all exist in the mainstream music industry because of the scale of major record labels, which are run like machines, because of their lust for money and not content. Some have gone even further moving into synergy and expanding into completely unrelated areas like an unstoppable disease. 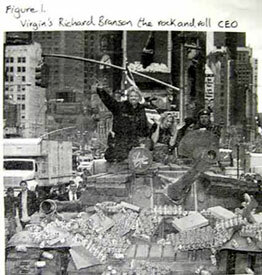 The best example being Richard Bransons Virgin Empire, which started life as a record store and is now producing cola among other things. As these companies expand to encapsulate more product areas and more locations there is less and less room for small businesses. Starbucks the coffee shop chain uses a special formula. " Starbucks policy is to drop "clusters" of outlets in urban areas already dotted with cafes and espresso bars. "13 This system means that Starbucks stores sometimes end up competing with each other which although a slight draw back means "that its cannibalisation strategy preys not only on other Starbucks outlets but equally on its real competitors, independently run coffee shops and restaurants" 14 which "can only profit from one store at a time." Such aggressive marketing has sparked a lot of resentment among the anticorporate community. 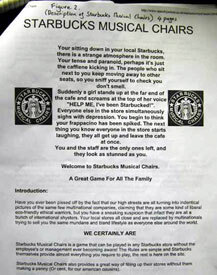 The Space Hijackers mentioned earlier have invented a game, which uses the musical chairs model to attain a revised atmosphere to the one intended within Starbucks stores. The Constellation ideology stretches out and embraces people who have been cut out of the music industry by the marketing racquets of major labels. Each recording released has had a huge amount of thought and debate put into its creation. Everything from the design of the packaging to the artwork and layout is considered "to create cultural objects that are inherently critical of the system" 15 both unique and beautiful. Which makes buying a record much more exciting because it feels like someone is trying to talk to you, trying to tell you something through the music and what is on the sleeve. " I remember being really happy trying to decode records when I was a teenager  there wasnt a wealth of information, just a photo of the band on the back maybe, a lyric sheet insert, whatever was on the cover, and bing bang boom go! Youre there yourself. 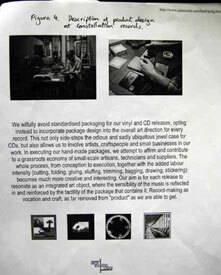 "16 Here is a picture of one of Godspeeds inserts from their first release. 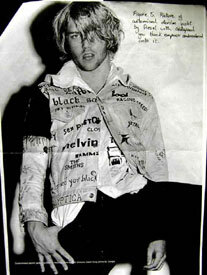 With this came a small envelope with a silk screen-print a squashed coin and a flyer for one of their first gigs. All of which was put together and made by Constellation, Godspeed and local crafts people. It is this commitment to community, abandonment of capitalist belief systems and political awareness, which sets Constellation and the bands it promotes apart from the whirlwind music industry. What Constellation have done is incredible and awe inspiring. They have set out to produce cultural objects, which stand in opposition to "Fin-de-siecle capitalism" by " maintaining a human scale. "18 However the great malaise of globalisation is affecting us all and has been developing for quite some time. Suffering has become disposable and were all alone. This loneliness has matured due to a departure from local community and the need to be part of the global community, which does not exist in reality. We now live in a world where many of us dont even know our neighbours. The rapid growth of technology and free trade means, "Never before in modern times has the gap between the haves and the have-nots been so wide. "19 Some of us struggle to make our voice heard and make a stand but continually these voices are bought and sold back to us as a new marketing scheme devoid of cultural significance. 5) Naomi Klein. NO LOGO: Flamingo.2000. 1) Naomi Klein. NO LOGO: Flamingo.2000 p62 (Virgins Richard Branson the rock-and-roll CEO. 6) Flyer for Look Left and Right.